A rendering of the One building in Toronto, designed by London’s Foster & Partners. Toronto is about to reach new heights. And the city will get there – 306.3 metres in the air – with a building that swaggers on the skyline and brandishes its brawn. Canada's tallest building, marketed as the One, is under construction at Yonge and Bloor Streets, and a ceremony will mark the official groundbreaking Thursday. Ambitiously conceived and thoughtfully designed, it is poised to be the best tall building Toronto has seen since the 1960s. 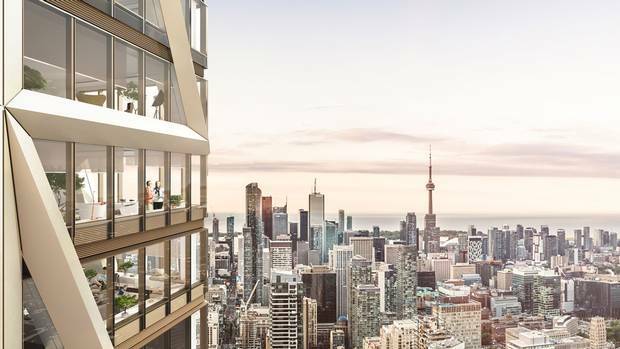 The 85-storey tower will combine seven levels of retail and restaurants, a 175-room hotel and then a roughly 60-floor stack of condo apartments culminating in multilevel penthouses. It is essentially three towers piled on top of each other, and you can read that in the architecture. Designed by London's Foster & Partners, with locals Core Architects, the scheme pushes the structure to the edges of the building: On each of its four sides are two "mega-columns," as the architects call them; from these, diagonal bracing extends up the faç ades, suspending a series of rectangular blocks within. The materials will be pale glass and champagne-coloured cladding. Up top, the columns come together in a basket that will shelter a copse of trees. 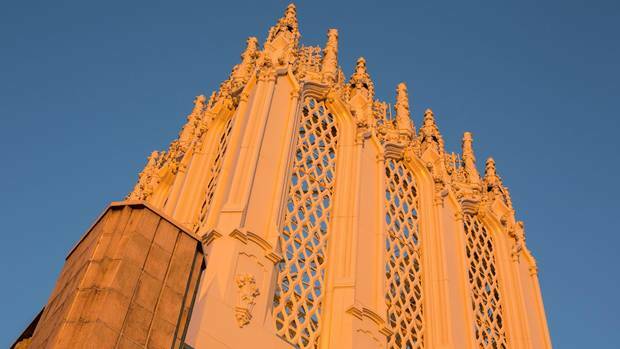 This structural bravado will create a tower that looks like no other in the city – recognizably the work of Foster, and beautifully resolved. While the diagonal braces have become less pronounced since the first design emerged in 2015, they remain distinctive, cutting across an otherwise disciplined grid of thin vertical mullions and thicker horizontal beams. "We feel that articulation of the structural frame is a strong image for the building and will become a talking point," said Giles Robinson, an architect and senior partner with Foster & Partners. It's remarkable, in fact, that the design is coming out so close to what was proposed 2-1/2 years ago. Its principal developer, Sam Mizrahi – who, not long ago, was a dry-cleaning impresario facing tough times – seems likely to pull off one of the great coups in the history of Canadian building. He faced a lot of flak for (legally) tearing down the former Stollerys building on the site, struggled with his partners and lenders to advance the $1-billion project and yet has managed to keep the deal together. He will put his stamp on a skyline ruled by big banks, insurance companies and real estate dynasties. It's no small feat. The main change has been revision to the retail areas. Rather than an eight-level retail mall, for which there's no precedent in North America and which could have been an epic failure, Mizrahi is adding the hotel. Otherwise the building is significantly shaped by the requirements of its main-floor retail tenant, long rumoured to be an Apple store. That first level will be 33 feet tall and – thanks to the columns around the edges – wide open. "We've tried to create an effectively urban room," Mr. Robinson said. 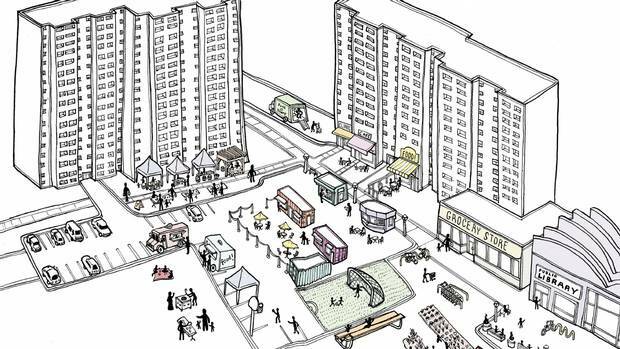 "A space that is permeable visually and spatially so that it becomes part of the street." To the designers' credit, the building will land on the street well. The elevator lobby is set back, off to one side along Bloor; along Yonge the building retains the facades of two Victorian storefronts in place, following standard practice for heritage retention in Toronto. (For better or worse.) Newly widened sidewalks and the open ground floor give the building – at least in the drawings – an airy presence on the corner. But up top, a building of this scale can't avoid a certain amount of symbolism. A tall tower is a business proposition, but it also inevitably embodies a certain amount of civic pride and ambition. A building of this scale has a special responsibility on the skyline and Mr. Mizrahi deserves credit for taking that seriously. From the beginning he went to Foster, an architecture firm of global renown, rather than the undistinguished locals who designed his first two condo projects in "traditional" style. That ambition will probably pay off for Mr. Mizrahi, but it will also pay dividends for the city. During a building boom that has lasted two decades, Toronto has built few towers of high architectural quality. Few developers have even aimed for that goal. Foster knows how to reach it. It is among the best big architecture firms in the world. Norman Foster co-founded the office in 1967, and by the 1970s, he was recognized as one of the leading architects of his generation; he won the Pritzker Prize in 1999. The firm employs more than 1,000 people, but continues at a high level of design ambition. The firm designed the new German parliament in Berlin and the Great Court at the British Museum; this year it marked the opening of Apple's new headquarters in Cupertino, Calif. If you want modernist architecture that is sober, tightly detailed and flashy in the classiest possible manner, Foster's office is the place to call. "We've just celebrated our 50th year," Mr. Robinson said, "and we've developed a language that begins in wanting to express the structural design as a key element." In the 1985 HSBC tower in Hong Kong, or the 2007 Hearst Tower in New York, or the Bow in Calgary, opened in 2012, "you express the tower frame in the cladding of the building. Whereas typically you see floor-to-ceiling glass that runs up the building, and that often creates a bland experience, our towers tend to be highly articulated in their experience." 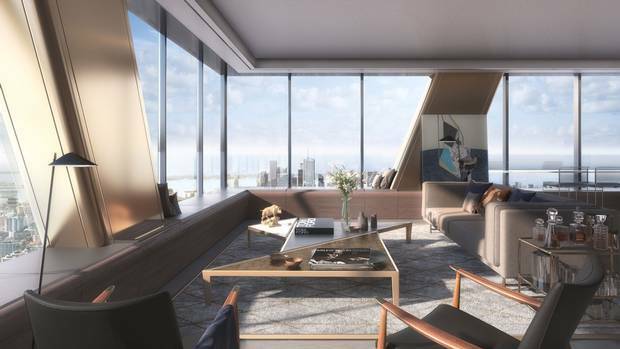 In the Bloor tower, that means residents will see diagonal beams cutting, punctuating their views. More importantly, everyone else will get to look at something interesting, not yet another anodyne glass tower. That's not to say there is much distinctively Torontonian about it. "This is very much," Mr. Robinson said, "a global building." True, and there's no shame in that. Big money tends to favour designers who have proven themselves, and Toronto's skyline is ruled by buildings whose lead designers are German-American (the TD Centre complex by Mies van der Rohe), American (First Canadian Place by Edward Durell Stone), and Australian (CN Tower by John Andrews). The one Canadian-designed tower among the city's heights, WZMH Architects' Scotia Plaza, is something of a fashion victim, dressed in 1980s pink granite. Will the One seem equally dated one day? All that pale gold cladding may not look good in a generation, but otherwise this Fosterian design should stand up well; the Foster buildings that looked radical 30 years ago look rather good today, and quality lasts. 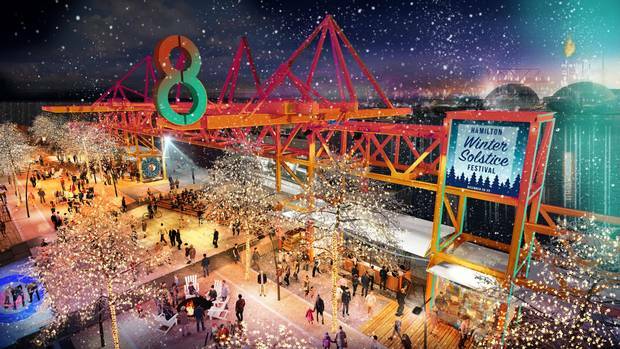 One thing is for sure: Toronto's skyline is being rearranged. You can argue whether it makes sense for the city to cluster much of its growth in just a few places, but that is indeed happening, and the fertile Bloor/Yorkville cluster will be capped with two dramatic spires. 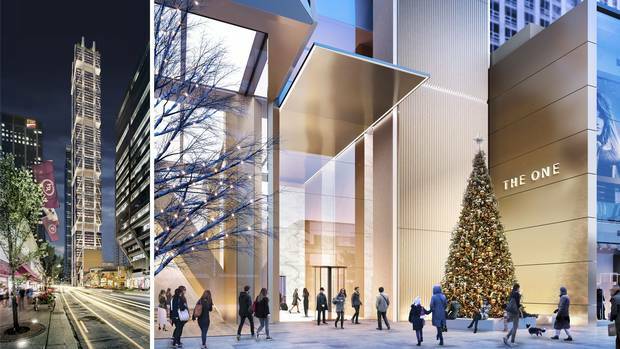 The 76-storey One Bloor East, by Hariri Pontarini Architects, is effectively done, and its curvy glass will have some steely company across the street. Yonge and Bloor "is the nodal point of the city," Mr. Robinson says. "The expression of that is important to make it a unique destination." Unique? Maybe not. But ambitious, and rigorous, in a way Toronto's skyline has rarely seen. How advocates and planners are rethinking high-rise tower neighbourhoods The apartment neighbourhoods of the mid-20th century house millions of Canadians – but their outdated planning stands in the way of street life and economic opportunity. The design for Hamilton’s new waterfront is city-building done right Drawing heavily on the city’s history of shipbuilding and heavy industry, new “Hammer City” space resonates with the community. Exploring the Art Deco legacy of Los Angeles Modern skyscrapers dominate the Los Angeles skyline, but the Art Deco movement that began in the 1920s remains a bedrock of La-La Land’s cultural legacy.